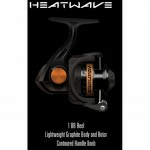 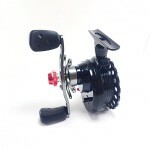 The Tight Line Plus (TLP) reel is unique among all the other ice reels out there. 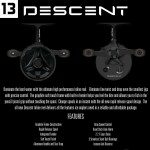 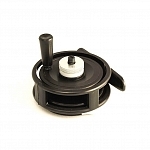 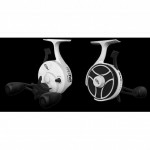 This unique ice/fly reel incorporates all of the functional features of the Tight Line Extreme reel, plus one very special feature, it has an anti-reverse selector switch. 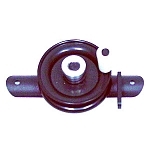 The TLP functions a lot like a manual winch on a boat trailer. 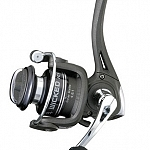 The anti-reverse feature allows the ice angler to pull line out while engaged to the handle through gearing when in the "off" position. 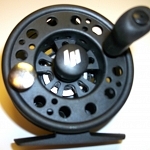 Yet, with a simple flip of the switch, the spool is locked so that the handle no longer spins when line is pulled out, but will reel line in at an impressive 2.4:1 retrieve ratio. 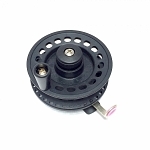 But unlike a boat winch, the TLP also incorporates a silky smooth, fully adjustable drag that can handle the delicate lines that we often use while ice fishing. 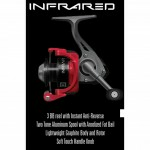 You will also notice greatly enhanced sensitivity because your fishing line reels straight into the "top" of the reel vs going into the reel on an extra sharp angle as in a traditional fly reel or any other non gear driven ice reel. 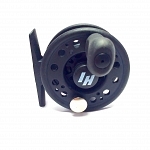 This straight shot line design eliminates all of the extra friction/drag that is caused when your delicate fishing line is stretched across the closest guide on your rod. 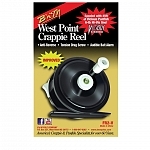 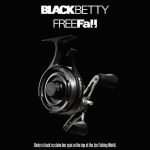 This reel does NOT have a true free spool function. 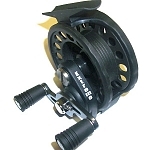 The reel handle turns when letting line out, with the spool under NO drag. 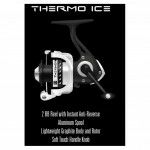 So, if you're like me and aren't sold on the whole "free spool" thing for ice fishing, The Tight Line Plus just might become your favorite ice reel! 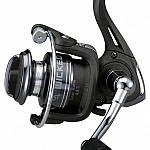 Please specify whether you reel with your left (left hand retrieve) or right (right hand retrieve) and we will make sure that your reel is adjusted and ready to go.